As will be apparent from the time gap between this and the previous post, I have not commented on anything for an uncharacteristic interval of time. Some of this is due to prioritizing, for example deciding that this or that matter is really somewhat trivial. The recent blockade of a road in Brant County over solidarity with an Aboriginal - related issue in British Columbia almost made the cut. However, with the publication of information in the most recent edition of Two Row Times (TRT) (20 February 2019), I feel compelled to speak out against the gross injustices that have occurred recently. All relate to the subject matter of the previous 3 of 4 Blog postings. In other words, there are notable developments in the outlandish rip off of the Canadian and Ontario taxpayers relating to stringing the high tension wires leading from Niagara Falls to the grid. The present post relates to content in the News (pp. 2-3), Editorial and Letters to the Editor (p. 6) sections of the print version of TRT. Online content from this newspaper can be viewed here. TRT is a relatively unbiased source of information concerning what is happening in "Six Nations Territory" whereas the other Reserve newspaper is an unapologetic supporter of, and mouthpiece for, the Haudensaunee Confederacy Chiefs Council (HCCC). Once again the concerns raised here are a result of the actions of the Haudenosaunee Development Corporation (HDC) and the Haudenosaunee Confederacy Chiefs Council (HCCC), specifically "Men's Fire". The HCCC is a group of individuals who purport to represent the original Six Nations hereditary system, and are vehemently opposed to the Six Nations Elected Council (SNEC) who are elected, and since 1924 are the only group recognized by the Provincial and Federal Governments. Numerous examples of the antagonism between the two groups can be found in the postings on this Blog. The HCCC's opposition to virtually anything proposed or accomplished by SNEC ensure that the Six Nations community is composed of two opposing factions. The acrimony is such that the HCCC will not even meet with the legitimate Elected Council for fear of giving up the claim to power that they insist is theirs alone. Unfortunately the most recent "efforts" of HCCC will ensure that millions of badly needed dollars will not be seen by the community, and perhaps risk a highly controversial agreement with Hydro One that, if re-visited, may well require the payment of not millions, but returning billions of dollars owed to the Canadian and Ontario Governments. A very risky proposition. To give a quick historical perspective, as profiled in the above noted Blog postings, in 2006 Six Nations militants "reclaimed" (stole) the Douglas Creek Estates (Kanonstaton), which had been property ceded by all the Chiefs of the Six Nations (including Nanticokes, St. Regis Onondaga, Tutelo and other smaller tribes who were members of the Six Nations before being absorbed into larger tribal / nation units) in 1844 (see the original documents in earlier Blog postings). As part of their unconscionable series of actions (e.g., arson, assault, mayhem), the militants put Mohawk Warrior flags on the metal hydro towers already installed, that needed only the stringing of wires to bring power from Niagara Falls to the grid system. The message was "cease and desist" "or else". The threats of violence ensured that gutless Hydro One simply abandoned the project and the forlorn towers (except the one taken down to use on multiple occasions as a barrier to traffic on Argyle Street and the Caledonia Bypass) sat idle from 2006 to 2018. Despite there being absolutely no legal reason to do so, Hydro One and the Ontario Government signed agreements with Six Nations Elected Council representatives to a deal that would "permit" the project to go ahead - with Six Nations receiving millions over 20 years for doing absolutely nothing; and with no compensation for the massive loss in revenue, the tax bill each year having been picked up by the Ontario taxpayer - not Six Nations. Clearly Hydro One just wanted to get on with it and were willing to pay money obtained by "negotiation" (extortion) to ensure that the project was completed. As has become standard practice, the HCCC and their representatives wanted to be cut in on the action, and to be recognized as the "legitimate" group that should be negotiating with Hydro One and / or the contractors doing the work. At the end of January the Men's Fire issued a "cease and desist" order (which has no meaning except to them), and they had threatened the workers that if they did not stop work, then people (specifically, "men from all the territories") would come streaming from the Reserve in great numbers (as they did in 2006) to forceably shut the work down. They would, however, let the project go to completion if they were given $250,000! That was a direct threat, that was extortion, and what did the Ontario Provincial Police do - nothing. I have not heard of any Court Injunction being issued, although there is every reason to do so. If a dozen people from Caledonia did the same thing the OPP would most assuredly arrest them, and a Court date would be set. However this is Six Nations, so the rules are different. Kid gloves, tread lightly - one set of rules for those defined as "Native" and another for those defined as "non - Native". A double standard which we came to see was to be the norm during the 2006 crisis, and had hoped that the dynamic had changed (there were successful Court Injunctions concerning developments in Hagersville and the massive McClung Road Avalon development east of Caledonia). The HCCC used as a rationale (if they bothered to use one at all) that Niagara Falls was Haudensaunee land and they must be consulted. As I have shown on multiple occasions, the "Nanfan Treaty" of 1701 was not a treaty at all, and even if it was considered legitimate by the Crown (which they did not), it only spoke of hunting rights. After the wanton genocide of the 1640s where all of the true "owners" of the land, the "Neutral" or Attiwandaronk people, were no more - having been tortured and murdered to "cleanse" to area of competitors in the lucrative beaver trade. While the then 5 Nations did establish 8 settlements in Southern Ontario after the genocide (giving them "rights by conquest"), by 1696 all were destroyed by the Mississauga and their 5 Fires allies (e.g., Pottowatomi as well as the Huron / Wendat remnants who escaped the fate of 95% of their people in the genocide of the 1640s). The "owners" of the land after then were the Mississauga, their descendants today being for example the peoples of New Credit (New Credit Reserve bordering on Hagersville). So if anyone is going to demand a "cut of the action", why is it not the New Credit people? In reality, the lands were purchased legally by the British Crown beginning in 1784, so in effect the land is now a part of the Province of Ontario. The stakeholders are those who pay taxes to the Canadian and Ontario Governments, and I might add, stiff fees for the electricity generated at Niagara Falls and elsewhere in Southern Ontario. Since the Six Nations community had been given a "sweetheart deal", it is amazing but not surprising that the HCCC would raise objections and try to shut the work down in order to assert their dominance. Hence once again we have the hereditary and elected councils pitted against each other (it has ever been thus - for almost 100 years now) - factionalism. In fact the Six Nations of the Grand River Development Corporation (SNGRDC), a legitimate body at Six Nations, is now faced with the wrath of the HCCC - and a significant loss of funds to the entire community simply to make a point by the latter. Six Nations have already lost $500,000 in much needed (although ill gotten) revenue. In an all too familiar portrait, at a meeting between the SNGRDC and the HCCC (a rare event), once again the latter torpedoed the dialog .................. why .................. because a wampum string fell on the floor and it was seen as "a bad omen". In a Letter to the Editor the unnamed author wrote that during the "heated dialogue", "the Chiefs Wampum, which represents the Fire, fell to the floor from the bench upon which it was situated". The reaction of the Chiefs and Clan Mothers was that it was then necessary to shut down the meeting and perform a propitiation ceremony to ensure that nothing bad comes of this event. In the Editorial, the Editor stated that while the HCCC claimed that this is, "a bad sign, there are others who would just assume that it was a happenstance". Correct, that is what reason and rationality would assert. The Editor goes on to say that, "because some beads fell on the ground, no matter how sacred one holds them to be, is not a sufficient answer to the people of the Six Nations" not to be able to find common ground. Once again the HCCC is acting on its own authority, through one of its various agencies (e.g., Men's Fire), and making demands that are in their own interests. They have never accounted for any money they obtained since 2006 when the Provincial Government was "forced" to make "compensation" for excessive, unreasonable, and irrational demands. So why trust them now - transparency is something that many at Six Nations are demanding before they would consider looking at the actions of the HDC or other hereditary council groups as legitimate or not. Follow the money. Who has the money? Were pockets lined at the expense of the community? How can anyone attribute any legitimacy to a group that will not open the books to ensure the monies have been used in an appropriate manner? However the bottom line, as alluded to above, is that the HCCC may be opening up a can of worms, or Pandora's box - and ultimately once again the community is in turmoil because of the actions of a small group of militants who take advantage of the Six Nations and the wider community. Frankly if it were up to those most impacted by the actions of the HCCC (Ontario taxpayers), after reading all the evidence, they would press forward to charge the Six Nations for standing in the way of this project for 13 years, and costing the people of Ontario multi millions of dollars. Instead the gutless wonders who make these decisions from Hydro One on up, cow tow to the unwarranted and illegal demands of those who should not have a stake in this work. What a crazy situation - and how much press coverage has this seen outside Six Nations? There was an update months ago, but where are the reporters in the general community who should be looking at the evidence, and keeping the public up to date with developments such as the brash extortion attempt by Men's Fire which will result in delays, and the loss of who knows how many more millions of dollars of taxpayer money. Why is there no Court Injunction against the Men's Fire to bar them from impeding the work of the contractors? Do the people of Ontario care that they are being dinged for millions of dollars? Does anyone care that this has come about due to blatant extortion? Since when is extortion not a crime? Are Six Nations to continue to be "given a pass" with false claims and questionable actions in the matter? This is in the "you have got to be kidding" category! Back in 2006 the Six Nations criminals who stole the Douglas Creek Estates property, vandalized the Caledonia Hydro One sub station, destroyed Hydro One towers to use as barricades, and through threats and intimidation refused to "allow" a multi billion dollar project to be completed - now want in on a proposal to "re energize" these towers / lines. They would profit to the tune of millions for acts that cost the Ontario taxpayer billions. That is simply in the crazy category. Six Nations proposes to re-energize idle hydro line shuttered by Caledonia protests. As stated in the article, A long-idle, $116-million hydro transmission line meant to strengthen power ties between New York state and Ontario may be finally completed following a deal that’s been brought forward by Six Nations, the province and Hydro One. The Niagara reinforcement line (NRL), a 76-kilometre power line that was never completed due to the 2006 Douglas Creek Estates protests in Caledonia, is back on the table for completion pending community input in Six Nations. Furthermore, Six Nations of the Grand River Development Corporation (SNGRDC) has reached a tentative deal with the Ontario Ministry of Energy and Hydro One that would complete the final five kilometres of the NRL along the Highway 6 bypass in Caledonia. In exchange, the Six Nations community would receive "long-term value" in the form of ownership and capacity for renewable energy projects. A CTV News investigation in 2015 revealed that the incomplete NRL has been costing Ontario taxpayers millions of dollars as it sat idle. According to CTV, Hydro One has been billing taxpayers for interest payments on the NRL. The total from 2007 to 2015 was just shy of $50 million. There is NO RATIONALE that could justify this action whereby Six Nation profits in any way from this work. There is no treaty of any description, there is no unsurrendered land anywhere in the Grand River Territory, the lines do not run through the Reserve - so why involve Six Nations and reward them for their criminal acts? Please view my previous posting (click here) for further details and photos of the forlorn towers rusting in place devoid of any power lines. I had no awareness of this "deal", and my views of a few days, weeks, months and years ago still stand. The absolute absurdity of this whole business can be seen in the following statement: “It is our plan to advance our community’s interest and see (the NRL) completed,” SNGRDC CEO Matt Jamieson said at the first of 10 community engagements sessions last Thursday at the Gathering Place in Ohsweken. So this work can only proceed with the permission of Six Nations! That is beyond the pale. An absolute travesty. A slap in the face of every Caledonian and others who have been forced to endure the criminal acts surrounding Douglas Creek Estates for 11 years. We have been forced to view the fruits of their misdeeds over and over as recently as last month as the remaining part of one tower is dragged across Argyle Street to protest whatever. In this case Six Nations have NO RIGHTS only RESPONSIBILITIES. They must pay compensation and damages for their acts before any consideration of including them in such deals goes forward. What sort of topsy turvy world do we live in where the criminals call the shots. Further words fail me at this time. It is the intention of the Wynne Liberal Government to privatize Hydro One, which supplies electricity to the people of Ontario. To say the least it is seen as controversial, hypocritical, and a way to pay down the immense debt created by McGinty and his successor Wynne that came into being due to gross incompetence on so many levels. Just google "gas plant scandal ontario" for some eye opening information. Now, it seems to have occurred to some Liberal politician that if some sweet deal can be offered to the poor "victimized" "Natives" of the Province, it will gain political traction and give the appearance of the Liberals being understanding and supportive of the "special status" of those designated as "Native" in this Province. The following is from Two Row Times, 27 September 2017, in an article entitled, "Hydro One sale to First Nations offers potential" - click here to view entire article. The deal: Of the 60% of Hydro One to be privatized, A 2.5% slice of that 60% was opened up collectively to Ontario’s First Nations communities in 2016 when the Chiefs of Ontario announced an agreement-in-principle with Hydro One. The plan? Liberals promised to open up 15 million shares to Ontario’s First Nations communities at a reduced rate of $18 a share — that’s about three quarters of the standard share rate of just under $24. Furthermore, "According to stats released by the Chiefs of Ontario the deal has long term potential to increase to $1.2 billion dollar value over 25 years." Sweet deal, but only for "First Nations" - everyone else gets at best sloppy seconds. More specifically, First, in order for the deal to go through at all 80% of the First Nations communities in Ontario have to come on board by the end of 2017. Next, if a base threshold of 80% of First Nations communities in Ontario are in agreement, which Hill says is just 107 of the 133 communities, the deal will be finalized. However, if 106 say yes and 27 refuse – Hill says the deal will not proceed. If ratified, the First Nations who agree will start a limited partnership, called Sovereignty Wealth LP, to collectively hold the shares. Ontario will then give that LP a 25 year loan of up to $268 million dollars for the purchase of the shares. Finally, in addition to the loan the province is offering $45 million dollars for seed capital over the course of three years. You can almost think of it as the “free gift with purchase”. The Chiefs of Ontario have agreed to bank that seed money to collect interest as an investment into the future generations. That seems rather generous, for some, the "chosen ones". 1) The Smoke Shacks: At this point I don't know how many illegal shacks are situated illegally on Hydro One owned lands selling illegal untaxed cigarettes. The most obvious one is at the corner of Argyle Street South and the Caledonia bypass (which at one time included a hamburger stand shut down by the Health Department for appalling sanitary reasons). These squatters are being allowed to stay because no one has the fortitude to enforce the law and remove them. The hypocrisy is that if a resident of Caledonia were to do the same thing they would be arrested and the operation shut down immediately. Those shacks have been in place now for 10 years and with no signs of any movement to change the status quo. At the very least the owners owe Hydro One rental or lease money for this blatant misuse of Hydro One lands. 2) The Barricade Tower: During the riots of 2006 when Six Nations members created anarchy in Caledonia and surrounds, "land protectors" (i.e., thieves and vandals) used what must have been a cutting torch to bring down a Hydro One steel tower, which the "protesters" dragged across Argyle Street South as a barricade. Many of us will recall the militants standing defiantly with Mohawk Warrior flags in hand and masks to cover their faces on this tower stolen from Hydro One. Most will know that the Ontario Government capitulated to the demands of these criminals and gave them the Douglas Creek Estates (DCE) property, and via negotiations, the much larger Burtch property in Brant County as a condition for the Six Nations militants to remove the barricade. Over the years the tower disintegrated to a stub, which as recently as 25 August was lying across Argyle Street South in the most recent event of this nature. It was removed from its "resting place" immediately behind the gates to the DCE by the Ontario Provincial Police on Sunday 24 September 2017. Clearly a valuation must be made of the property that was removed, and Hydro One must be compensated for every penny owed. 3) The Unstrung Hydro One Towers: The above tower was part of miles of similar towers extending from Niagara Falls to the Toronto grid. In 2006, after the tower was removed, the Mohawk Warriors or their supporters defied anyone to enter Hydro One property and finish the work to link Niagara Falls and Toronto. Hence, since the towers were proximal to the DCE site, inertia, fear, timidness and whatever else has ensured that the towers stand there forlorn - extending as far as the eye can see from Argyle Street South, with absolutely no high tension wires, only empty pulleys, as seen in the picture below. The amount of money lost by Hydro One thanks to the actions of Six Nations militants must be close to one billion dollars. Calculations by knowledgeable people need to be made to have a clear sense of what is owed to Hydro One. The Point: It seems that any agreement involving Six Nations involving Hydro One MUST take into consideration how much money is owed to the latter by the former. There is no negotiating this away. Hydro One and thus the taxpayers of Ontario have lost significant revenue due to the criminal actions of Six Nations. Hydro One and the Province of Ontario need to DEMAND the money that is legally theirs. Until this matter is settled, why would the Province even entertain the idea that Six Nations can "get in on the action" with this new arrangement. It is high time that the actions that lay at the doorstep of Six Nations are fully addressed - otherwise the whole concept of justice and the law are simply meaningless - or is Six Nations immune here? Here is an update on the "situation" at the Douglas Creek Estates (DCE) "protest central" site. Any one who thinks that with all those tents scattered about DCE we are seeing a sign of stability need to look through the other side of the binoculars. This is a staging area for further "action", and it is only the constant presence of the Ontario Provincial Police (OPP) that has kept a lid on things. An article in Two Row Times of 27 September 2017 entitled, "Highway 6 protests peaceful but tense" (not found in online version) we obtain an update on the shenanigans at DCE that few if any would have seen - even those of us who live in Caledonia and surrounds. You don't have to be a rocket scientist to predict that once the ruling was made in Brantford, basically in support of the Elected Council, the "protesters" at DCE (supporters of the Hereditary Council) would have some knee jerk reaction that would be totally in line with what they have done previously (since they appear to lack any imagination and ability to formulate a viable Plan B). Protesters (Domestic Terrorists) Perspective on the Burtch Matter and Provincial Courts: A spokesperson for the "protesters" was interviewed about OPP actions they took on 25 September 2017 (described below); and about the ruling of the Superior Court in Brantford concerning the Burtch lands. In relation to the latter, the person replied that it was not the Court case involving a dispute between the Hereditary and Elected councils that was the trigger to recent action at DCE, but rather, "The promised return of this land [Burtch] to the Haudenosaunee Confederacy Chiefs traditional government, as it was when it was stolen by Canada many years ago, did not happen". This is bunk. Thanks to blatant extortion, the land was promised to the people of the Six Nations via their legal representatives which is the Elected Council. Secondly, the land (the Burtch property) wasn't "stolen" it was surrendered by all of the Hereditary Chiefs in the 1840s so that it could be sold and the monies placed in the Trust Account for the benefit of the Six Nations people. I could easily post the specific documents about this property as I have for the Douglas Creek Estates property (if needed I will) - but what is the use, these know nothings won't care one way or the other. As much as the "protesters" appear to be those who don't recognize the Six Nations Elected Council (SNEC) as the legitimate representatives of Six Nations in day to day running of the Reserve or negotiations with Canada, we get a hint that the "protesters" aren't any too pleased about the present Haudenosaunee Confederacy Chiefs Council (HCCC) either. The above "protester spokesperson" stated that, "I'm not saying the Confederacy doesn't have a lot of work to do as well, in terms of making sure they get the voices of the people heard". Apparently relying on the Great Law will do the trick (although there are different versions and interpretations) - so in other words the old bed bug in the ointment, factionalism, is still alive and well even within the "protester community". The spokesperson further explained that, "the protest is the only choice left to them, since the court will always relay [rely] on Canadian Law which is severely slanted towards Ottawa and London England". So what is the solution here, cause as much disruption to Caledonia and surrounds until the Canadian Government cries "uncle" and gives in to this group and thereby sets a precedent which would cause chaos across the country. They will never do that. Eventually they will send in the Canadian Forces as Pierre Elliot Trudeau did many years ago during the FLQ Crisis in Quebec. I recall armoured vehicles and soldiers with assault weapons on our street. They were welcomed. Furthermore, according to the spokesperson, "Some judge can sit in a court in Brantford, Ontario and say that the Confederacy, which has been around for 1,000 years or more, is not a valid government here - well that's the problem" [about the Court ruling in the Burtch farming case]. All the judge did was to cite someone for defying a Court Order, one submitted by SNEC the only currently legitimate authority at Six Nations. It is hopeless when uneducated people obtain the reins of authority in "protests" of this nature since perception is reality and no amount of evidence can change their thinking. So instead of relying of the Courts, and evidence, the "protesters" have in their wisdom decided that, "Wins are made on the land. Wins are made in the bush. That's the only place we get our wins from, and so, if we are going to start asserting our sovereignty it will be on the land and on the roads and in the bush. We are Two Row Wampum people and we are defending that sovereignty". So in other words, create as much discomfort for the unlucky people who happen to reside close to the Reserve! That is sure to win many friends both on and off the Reserve. Good luck with that. Brilliant tour de force I must say. How about contemplating Canadian Forces troops in "the Bush" to root out the terrorists and restore law and order in the region. OPP Tactics: On Saturday, 23 September, the OPP noticed that the occupiers of DCE were dismantling some of their tents. Apparently what was in progress was the plan to move these tents to a new location, "on the River Range Road overpass, looking down on the busy Highway 6 overpass". This was clearly an act of provocation and could have been the beginning of a new "initiative" in blockading the area. So the decision last Saturday was to take the banner (seen in a photo in my earlier posting) and establish a satellite protest site at one of the roads (7th Line / River Range Road apparently) crossing the Caledonia bypass. There were people braiding white corn - all very festive. Apparently the road was not blocked, but as history tells us, in a heartbeat things could change with tire fires, items tossed on the bypass from above - who knows (although tried and true techniques from former days are pretty well everything in the toolkit). As dark set in on Saturday, "the bridge site was voluntarily removed and the protesters returned to Kanonstaton (DCE)". Unfortunately for the "protesters" there is simply not the same support on the Reserve that there was in 2006 - the thugs they can always depend on, but not the majority of the Rez. Understandably the OPP were concerned that this was a set up for another Highway 6 blockade, so the, "OPP converged on the Highway 6 site enmass, parking a number of cruisers in front of the gate at Kanonstaton to prevent that from taking place". Apparently the OPP were about to arrest one of the "protesters" but backed off when surrounded. There is still the possibility of charges being laid at a later date (the OPP know who they are dealing with). "The next day, Sunday, police removed the concrete blocks in front of the Kanonstaton site as well as the remnants of the hydro tower used in 2006 which has been used a number of times since to prevent traffic on the highway. Once again the protesters remained peaceful but objected loudly". The ringleader said, "I guess they thought we were going to put the barricade back up on Highway 6". This same person has the gall to say that the OPP over reacted since all they planned to do was, "gathering to take a picture of a sign they designed using the white corn - braids they made at the overpass earlier". Oh yes, that is really believable! The Turtle Island News of 27 September 2017 has an article on this subject called, "OPP remove tower from Kanonstation [sic] after night of 'cat and mouse'" part of which can be seen here. After purchasing a hard paper copy of the paper, the content here provides few further details. They say that the OPP was trying to arrest the man due to outstanding warrants (BTW Six Nations Police will get him later), creating a back and forth with the tower being moved to the entrance to Surrey Street (and DCE), then back again. Apparently early in the afternoon the OPP decided that "game of cat and mouse" had gone far enough - that this would eventually result in the tower being dragged on Argyle Street South (only a few feet away) again (highly likely), so when it was on Surrey Street outside the gates and at 2 p.m. the OPP formed a line and they removed it along with the concrete blocks which have also been "pressed into service" in order to block the road (Argyle Street South). They told the "protesters" that the reason was to prevent, "commission of any offence and to prevent the materials from being a traffic hazard". Great move - score one for our OPP. There is a photo in the newspaper showing a flat bed tow truck winching the tower on to its bed. Now that wretched reminder of "the bad old days" is gone, and the "protesters" will have to find something else to drag on to Argyle Street South. It was interesting to note the above wooden "tower like" structure placed in the same location as the old Hydro One stub of a tower before its removal last Sunday. So, the question is, what is its purpose? I can guess, but time will tell. An Assessment and Message for Those at DCE: To the "protesters" - you are beat, done, kaput. There is no more wiggle room, especially in those tents. There is a nip to the air, and it will soon be downright uncomfortable to sit for hours pondering your navel while the world spins all around you. Those with any smarts will know it is time to pack up and go home. You have no support off Reserve, and below 10% on Reserve. The business folk along 6th Line alone will find a way to "get you gone" - always better to leave on your own terms. The "protesters" are now dealing with an OPP who is very savy to the antics of this group of agitators and can well see what the next step is going to be. Lets say, it seems that the OPP has learned over the years since 2006 what to expect from these disgruntled Onzlows. Apparently some 20 to 30 "protesters" were established at the DCE site on Monday. Guess these worthies must own their own businesses or something - to be able to take so much time off work to "protest". One thing is a constant at Six Nations, due to false narratives and outright lies, there are always going to be "buyers" for nonsense, and things will NEVER reach a "settled state" for anyone who lives anywhere near the Reserve. Why, because once again the real problem boils down to FALSE BELIEFS, totally unsupported by anything (a document, or, well, anything what so ever), that the land along the Grand River is still Six Nations property because it was taken from them by the nasty Colonial Government sometime after the Haldimand Proclamation of 1784. The TRUTH is that all of the Chiefs in Council, in other words all of the Hereditary Chiefs (as per "The Great Law"), signed documents from the 1780s to 1847 which they saw as being in the best interests of the people of Six Nations. Their decisions resulted in the consolidation of the scattered properties into one large Reserve, IR 40 in Tuscarora and parts of Onondaga and Oneida Townships, and stemmed the flow of Six Nations people to the west and allowed them to live together "as a people". Had the wise Chiefs not done this I can guarantee that the Six Nations would have merged into the general community and would just be a page in history and a line or two in family trees. In a subsequent posting I will show how the land was sold off piecemeal by individual Six Nations residents to "settlers" as the only way to bring in enough money to sustain their families (since only the Mohawk had large farming operations capable of supporting their families and having enough money to live in comfort). In other words I will provide objective truth based on contemporary facts and evidence - in contrast to personal truth based on wishful thinking and long standing beliefs so entrenched that they are accepted without question. There are those who know in their heart of hearts that something is desperately wrong. Tents, ticks and tempests. Being let down by the people you thought were fully on board. Disappointments at every turn. Year after year passes and the same angry unsubstantiated claims are made about colonialism, cultural genocide and scores of other bogus concepts which draw people into the victim mentality and learned helplessness and an inevitable downward spiral when they buy into the blame game. This stuff strangles the life out of you. There is no such thing as personal responsibility at DCE, and often beyond, only finger pointing at others who are the perceived cause of intractable problems. A hopeless situation really for which there is no solution - except escape from the constraints and negativity by moving away - better than being sucked down the toilet of life and ending up a bitter broken individual grasping at intangibles and contributing nothing. I can guarantee that you will just be dragged deeper and deeper into the quick sand. Not a pretty prospect. What if a mega far reaching law suit is in the works? One which will require testifying in Court, and the possibility of immense fines (recall 2009, Brantford Superior Court). Those millions that have been extracted by the Haudenosaunee Confederacy Chiefs Council (HCCC) and their enforcers at the Haudenosaunee Development Institute (HDI) will not likely be enough to pay legal fees let alone a small fraction of the terms of settlement. Those that can see the writing on the wall, will act accordingly. Time to decide what side of the fence (such as the one surrounding DCE) you stand upon - no not the canoe or the ship legend so full of holes that both sink - but falling backwards into darkness at DCE versus standing strong and moving toward the light. This assessment may resonate with some at DCE, others not so much, and many not at all. Truly trying times though. I have repeatedly said that the ONLY way that the thorny issues of claims of treaty rights, supposedly unsurrendered land, and who has the right to govern at Six Nations Reserve can only be settled by the Provincial Superior Court system in either Brantford or Cayuga - or if the Federal Government gets involved. A very important, and likely precedent setting, decision has been made by Justice Harper of the Superior Court in Brantford - one that basically eviscerates the assertions of the Haudenosaunee Hereditary Chiefs Council (HCCC) as being the legitimate governing body at Six Nations, and basically neutering them by recognizing the Six Nations Elected Council (SNEC) as the representatives of the Six Nations people tasked with speaking for Six Nations in any matter involving the Provincial or Federal Governments. The whole despicable saga of the theft of the Douglas Creek Estates (DCE) property by Six Nations militants in 2006 under the guise of claiming (falsely) that the land was unsurrendered, the barricades set up across Argyle Street South, the Provincial Government purchase of the DCE property from the legal owners and "gifting" to Six Nations, and the negotiations to extort money or land from the Government (Provincial or Federal - it ended up being Provincial) in order to have the barricades removed has been detailed at length multiple times in this blog - and there is a wealth of info online. While SNEC is the legal representative of Six Nations, the instigator of the "land reclamation" (theft) was orchestrated by HCCC, the previous governing body at Six Nations (until 1924) and members of same who were to become the Haudenosaunee Development Institute (HDI - the "muscle"). To keep peace in the family, SNEC offered HCCC a seat at the negotiating table (although the latter were NOT happy about this arrangement). That was 2006, but what about 2017? Recent events, including the schlepping of the Hydro One tower (what was left of it) over Argyle Street South in Caledonia on 10 August 2017, came about via a dispute over who should have the say as to what happens with the Burtch lands in Brant County. The "main event" involved a woman (Kristine Hill) and her ex - husband (Ed Green), supporters of the HCCC and its "enforcement branch", the Haudenosaunee Development Institute (HDI). She had tilled the land, and planted crops on the Burtch property. They claimed to have a lease from the HCCC, and ignored an order from SNEC to vacate these lands. To make a long story short (since this is not the point of the present posting), Ms. Hill lost and was found to have "willfully disobeyed" a Court Order to vacate. Details of this case can be found in The Sachem, 22 September 2017, in an article entitled, "Judge rules in favour of Six Nations Elected Council over Burtch property" - click here. What is important in the wider sense is that in a court of law the claim that the HCCC was unable to muster even rudimentary evidence that there was merit to this case, which hinged on their authority to determine the rights of Ms. Hill to farm the land at Burtch. 1) The ruling of Justice Harper that, he could not recognize the HCCC’s right to decide the future of the Burtch lands based on Hill’s statement that she was raised to pledge allegiance to the Haudonosaunee chiefs. Harper said he was unable to Hill’s argument because there was virtually no evidence presented to him by her lawyers supporting the claim. 2) The Court Order was issued, in response to a claim by Six Nations Elected Council (SNEC) that they hold the title to all 380 acres of the Burtch lands through a corporation (9646035 Canada Limited) created to keep the lands in trust for the people of Six Nations. 3) In 2006, Six Nations extorted what became known as the "Peterson Promise" from the Ontario Government. In essence, "we will remove the barricade across Argyle Street South in Haldimand County if you given us the Burtch Correctional property in Brant County such that we can add these lands to the Reserve". More specifically, The “Peterson Promise” stated that the land would be returned to the status it once held under the Haldimand Proclamation of 1784, which allowed the Six Nations people to settle and live on six miles of land along the entire length of the Grand River, on both sides. The HCCC backed out of the negotiations before the agreement was reached. So even though both SNEC and HCCC were at the negotiation (extortion) table, HCCC walked out before any deal was reached yet has the gall to insist that they are the only group who have the rights to decide the fate of the Burtch lands! In desperation, the Burch occupier brought out the old boogey man of "Treaty rights". There is NO TREATY with Six Nations but that has never stopped individuals from using this tattered old worn out assertion to try to get leverage. It did not work. So Hill asserted, her Aboriginal treaty rights to farm the Burtch lands, Harper cited a case involving Tyendinaga and CN Rail that showed treaty rights cannot be asserted by an individual. Furthermore, to repeat, there is no treaty of any description that applies to the Six Nations of the Grand River. It is the hope of the present author that soon this matter will be taken to Court and Six Nations will be required to produce the phantom treaty. They won't do this of course because they would lose, and this would have tremendous implications for the extortion of millions of dollars from green energy companies and land developers in Southwestern Ontario based on making them believe that a treaty actually exists, and Six Nations need to have a cut of the action. 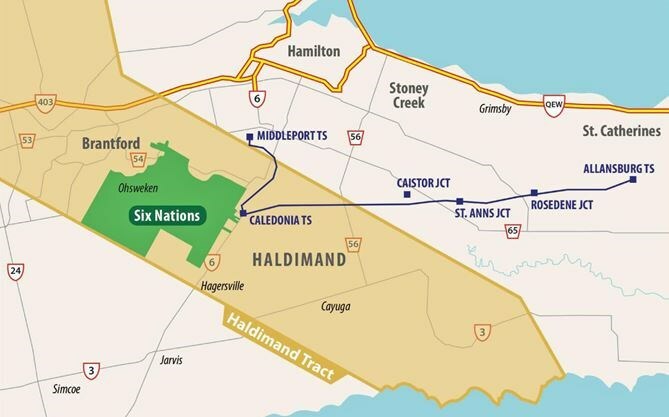 In other words, the proceedings have much broader implications for Six Nations and the people of Haldimand and Brant Counties. SNEC is the only group at Six Nations who can establish a legitimate claim to be the representatives of the occupants of the Six Nations Reserve - even if there is a large faction who disagrees. Lets hope that the can or worms, or Pandora's Box has been opened and we can obtain a Court ruling on all bogus Six Nations claims (treaties, unsurrendered land). We have been waiting a long, long time. What if the Federal Government said, "Ok, enough is enough, lets go to Court and let the evidence speak". Not going to happen, but I can dream.